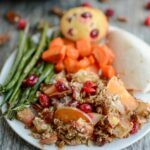 This Sweet Potato Apple Cranberry Crumble is the perfect addition to your holiday dinner. Make it for a quick and easy Thanksgiving side dish or pop it in the oven while eating and serve it with ice cream for dessert! In a bowl, combine apples, cranberries, maple syrup, bacon and 1/2 cup pecans and stir to combine. Slice sweet potatoes as thinly as possible (use a mandolin if you have one). Then cut the slices in half. Line a 9×9 pan with parchment paper. Divide sweet potatoes in half and place a layer on the bottom of the pan. Top with half the apple mixture. Add another layer of sweet potatoes and the remaining apple mixture. In a small bowl, mix oats, brown sugar and cinnamon. Cut butter in to small cubes and cut in with a pastry blender or two knives until resembles coarse meal. Add in remaining pecans. Spread crumble mixture over the top of the pan. Bake at 375 for 30-40 minutes or until sweet potatoes reach desired softness. (You may need to take it out and taste test a potato). Check around 25 minutes and if you feel the crumble is getting too brown, cover pan with foil. This can be served as a side dish or dessert. If serving as a dessert, you could omit the bacon and top with ice cream. You can also thinly slice and then dice the sweet potatoes and mix everything together instead of layering if you’d like. Just make sure the sweet potato slices are as thin as possible so they cook through!